Following the style of a certain other post. Air-to-air missiles were tested on the Mi-24 during the 1970s (Strela) and the late 1980s (R-60 and R-73). Some Russian publications report that a few GFSG "Hind" squadrons were equipped with R-60 missiles, unfortunately without giving further details and testimonials seem to be absent as if the subject was taboo. The fact is that the use of the Mi-24 based in the GDR for air-to-air interceptions cannot be questioned. On July 19, 1988 - one year after the landing of Mathias Rust on Red Square with a Cessna 172 on May 28, 1987 - USMLM tour officers observed a Mi-24K and a Mi-24V from Stendal performing air-to-air combat training. However, back in 1986, a USMLM report mentioned this: "... HIND helicopters were observed in combined arms attacks, working closely with fixed wing aircraft, during night flare and adverse weather training, and in possible air-to-air intercept scenarios." So I think the authenticity of such an armament is strongly supported. Current USSR helicopter line up is the definition of "overlap" right now. Back in EE where you would take the whole family it wasn't a problem, but now in RD things need to be differentiated a bit more. With the Mi-24P now in it's rightful place of gunships, the Cat-C or B ATGM helicopter role is accounted for. In Cat-A forces, ATGM role is covered more effectively by the Mi-24VP, Mi-28 and Ka-50. Giving the Mi-24V a new role would help fill a gap in the USSR line up and break up the monotony of this area. A dedicated AA helicopter is sorely needed so that the USSR can at least compete in the opening Helo rush stage. A high cost and limited ammo count would be weaknesses compared to other more dedicated platforms from other nations. 4x R-60M on underwing mounts. 4x Kokon on wingtip pylons. Helicopter version of R-60M modified to 2625m* Helo and 2275m Jet ranges. Where does another expensive AA-Chopper help USSR? 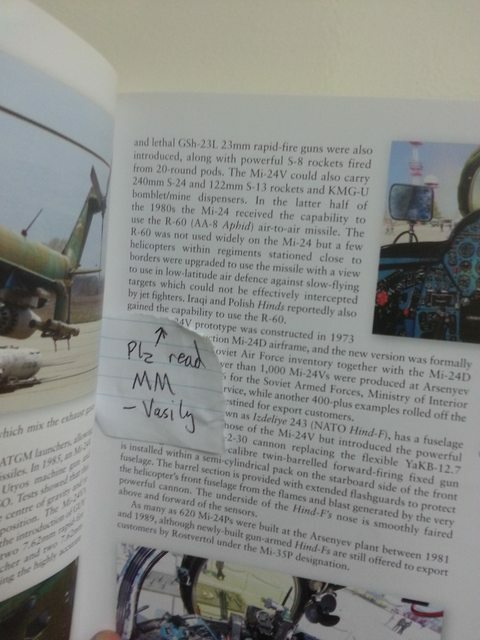 They need something cheap, like that "Mi-24 Afghanski(?)" that was mentioned somewhere for example. I like it, a good fix to a annoying problem Russia currently has. But better late, than never, SU needs it's 24V re-roled/copypasted. 90p would be better than Akula ok. Still too expensive to go against Nato Stinger Helos. ch3cooh wrote: 90p would be better than Akula ok.
it would out range Stingers so the competition would be equal. Also, two hits to kill hind, while just one to kill them. That, and it would also be way faster than, for instance, the OH-58C/S. That's fairly important in the opening rush. The lack of an AA chopper and affordable infantry for the USSR is why I never play that faction and play NSWP instead. The Soviets need an AA chopper with the ridiculously big maps we have now. I don't really care how it happens, as long as it happens. Is it HE8 missile? I thought RedDragon supposed to be a raidboss in this game. It will be even more ridiculous than Z-9A. mrgray2011 wrote: Is it HE8 missile? I thought RedDragon supposed to be a raidboss in this game. It will be even more ridiculous than Z-9A. The Z-9A TY-90 is good only partly because of its good missiles, and mainly because it has a lot of them that fire really fast. It can single-handedly destroy a large initial helicopter push. That won't be true of an AA Hind.